I know what you're thinking, "What's she complaining about? It looks sunny and beautiful." You're right. It's been absolutely beautiful this week, but exceptionally cold for Northern California. I've been wearing jeans most of the week, but I recently discovered that I own 68 dresses (yes, you read that right!) and I'm making an effort to wear them more. Despite this unusual amount of dresses I still feel like I have nothing to wear. Speaking of nothing to wear, I can't decide what to wear to our blogger meet up tonight. If only I was going in this. If you're in the Bay Area I hope you'll come join us! Make sure to check back next week-- I have some big news! I adore this outfit; you look great! I luv this outfit! The small sparkle touches make it perfectly yours. Thanks again for the When Decades Collide give-a-way. I'm bidding on a dress now. Looking forward to shooting it. but you always look amazing! Im excited about tomorrow :) I work close so Im gonna come say hello. you look adorable by the way. love the green with leopard! I know just what you mean about the cold here in the Bay Area! I don't know what I'd do without my little heater in my bedroom, haha! I wish I could attend tonight's event and meet you in person, but I have work! Bummmmer. Hopefully there will be a next time!! Fab outfit Taylor!! I love the contrast of the jacket with the heart pin, and those boots are to die for! Can't wait to hear your news! so cute, I love the green shirt dress with the leopard jacket. Your heart pin makes me feel like Valentine's Day! This is such a gorgeous outfit Taylor, I love all the little details, especially your floral headband. Wow, that's a lot of dresses! Have a lovely weekend and enjoy your blogger meet up. Looking forward to hearing your big news. goooooorg!!! love that color green with the leopard and pop of red ban.do sequins! so pretty! wish i was on the west coast for your fab blogger meet up - have a lovely time! You look way cute! I adore kelly green with leopard. Great look! you look great Taylor, Im so jealous about tonight! Have a lot of fun wish I could join you all fab ladies! cute outfit. I love your coat! Love the dress! Did it come in that length or did you alter it? Beautiful! Love the dress and pin! HAVE FUN!!!! Precious look! love the heart pin! Your green tunic/dress is perfect! That is exactly something I need in my closet. I adore it. - Wish I lived on the west coast so I could check out the event you're going to tonight. Sounds like a great opportunity. Wish I was in CA and could go!! Such a pretty dress and I love it layered with the leopard print coat. You look beautiful as always! oh god, i don't even want to know how many dresses i have. i wear about 1/4 of them and then procrastinate wearing the others. i'm loving your jacket, and of course, that sparkly little pin. Lovess the leopard coat doll. I wish I was in SF to meet up with you - I absolutely love your blog! Have fun tonight, and I know you'll find something lovely to wear! 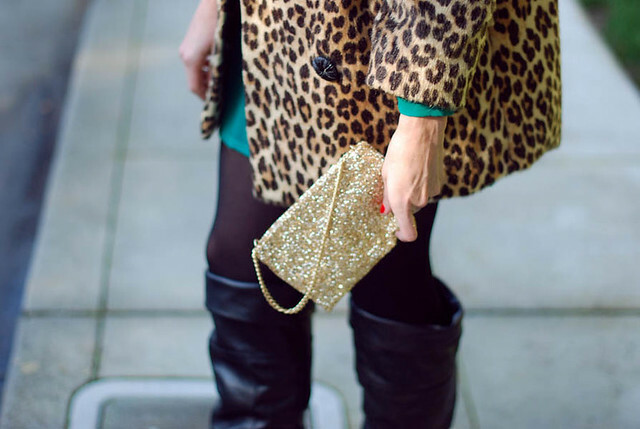 I love the rich green paired with the leopard coat and gold clutch - perfection! Ooooh that Chloe dress is niiiiiiiice. 68 dresses!? That's amazing! LOVE IT. Good call on trying to rock 'em more often. Tonight will be SO FUN! Aw! Jealous! 68 dresses!? wowww - that's awesome! wish i could go to the blogger meet up but i'm not in SF this week. i'm sure you gals will have an amazing time. love your heart pin! Such a cute touch! But mostly love your HAIR...it looks great wavy...not sure I have ever seen it that way before. LOVE the heart pin!! It totally reminds me of Julia's Valentine's party from Julie&Julia. That realization makes me wish I lived in a place where closet space was readily available! You look fantastic in this outfit--love the coat. Love this outfit! Almost bought that J Crew clutch! I am so tempted to go down! I wouldn't make it until 8:30 though and I'm sure the party would be over by then. Such a fun thing- especially to meet you and Katie. And I adore this outfit post. You pull off animal prints so well. I love that pink dress! It is fabulous. Have a blast tonight! I wish I could get up to the city, but perhaps we can get something set for the south bay/peninsula. cute dress! i wish i could make it tonight, but family dinner calls! have a wonderful time and i hope i get to meet up with you ladies sometime! That is a great green for winter. And I would have never guessed it went so well with that leopard print coat. Love the red heart pin mixed with the Cheetah, so cute! I wonder what your good news is! Have fun at your meet up! i've got that Bando heart and the J Crew clutch...we're practically twins! LOL! Also J.Crew has been rocking the glitter. Really love! I love your dress! Such a great color on you. This outfit is so lovely! I love these colors together so much! You have so many cute dresses! Love the coat, so chic! lovely outfit :) i really like your boots! I have been obsessing over that clutch for weeks now! Love the outfit! and yeah it's freaking freezing!!!! Love the leopard coat! I'm a sucker for leopard coats in general but that's an especially nice one. Interesting that you have 55 dresses. I'm not sure how many I have--it never occurred to me to count, but I'll bet I'd be surprised by the amount, too. you look gorgeous!!! Love this combo! I love the color of your dress, it looks great paired with the leopard coat. I love that heart clip from ban.do! It's so adorable. That dress looks wonderful paired with the leopard print! Drop Dead, Gorgeous Stila/MAC giveaway! That color is absolutely gorgeous! Amazing boots as well. Can't wait to see what you wear to the blogger meetup! (I love that Chloe dress you posted the link to, by the way). 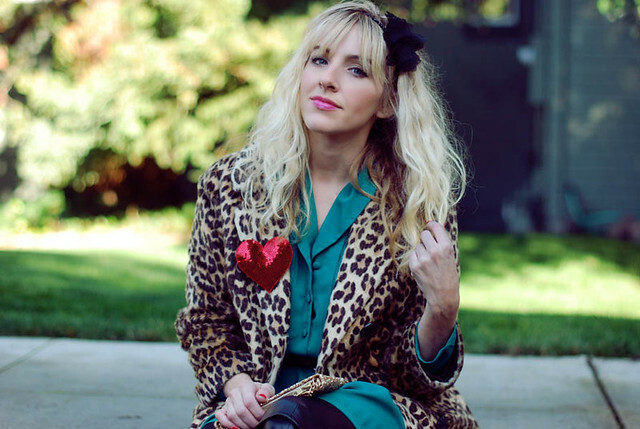 Love your faux leopard coat, looks fabulous combined with the green vintage dress! So sad I couldn't make it last night, but there was a certain lil' crumb who needed her mama! Next time, I'll be there! Love the leopard coat...I found one at an estate sale on Nob Hill about 10 years ago, and it still remains my favorite coat! I love your coat with that green dress! Great look all together. I LOVE this outfit on you! That red heart just pops out with that lovely red color. 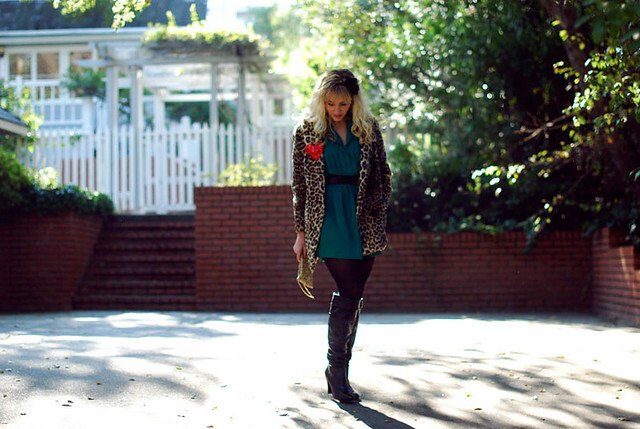 I love red+leopard together (in fact my outfit post on the same day as yours was leopard & red!). Love all the little touches here and there you incorporated with accessories! this out fit is absolutly adorable! i love every single piece.. I love this outfit!! The color of your dress is awesome and I love the little heart detail, so cute! You own 68 still after your cleaning?! :) I'm already in need of more space, no dress will fit anymore. Keep wearing those dresses, you have the weather for it. I hope the meet was a succes!